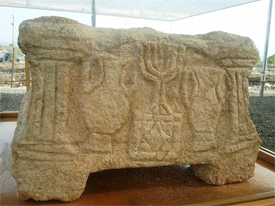 Archaeologists with the Israeli Antiquity Authority say they may have discovered remnants of one of the first Messianic Jewish congregations in Israel. Messianic Jews believe Jesus is the Messiah prophesied in the Old Testament. Messianic Jews made up the congregations of the early church who wrestled with incorporating Jesus’ teachings into their Jewish faith (Acts 15:1-12). Archaeologists discovered the remarkably well-preserved synagogue on the outskirts of the ancient city of Magdala also called Migdal. This is the community where Mary Magdalene was from. Magdala was an important fishing village located in a seven kilometre stretch bordering the Sea of Galilee, a region called Magadan in Mathew 15:39 and Dalmutha, Mark 8:10. Magdala was a short walk from Capernaum, and it was in this region Jesus performed many of His miracles and taught (including the sermon on the mount.) A number of Jesus’ followers were from this area. The synagogue was found accidentally in 2009. It was outside the zone where archaeologists were working. When construction was planned for a spot of land away from the main archaeological dig, archaeologists were required by law to survey the area to make sure nothing of significance was there. It was during this examination, the synagogue was discovered. Dina Gorni the lead archaeologist described the discovery as “kind of a miracle, I think,” as the area was not scheduled for a dig. However, when they discovered an elaborate alter under just 50 cm of soil, work at all other sites stopped as they focused on this new excavation. In an interview with the Global Mail, Gorni, who is not religious, made an unusual comment about the altar. “That stone had power. You could feel it,” Gorni said. There are a number of factors suggesting the synagogue, dated to the time of Jesus, was the home of a Messianic congregation. The first is its location at the outskirts of the ancient city of Magdala. It well was away from the main synagogue area located within the city limits. The second is the smaller size of the synagogue. The remains suggest it would have held about 120 people. Since Magdala had several thousand people, the smaller size suggested it was serving a smaller population of Jews. The third thing that caught archaeologists’ attention was the very ornate decorations in the church including a very elaborate altar. These type of carvings and decorations are simply not found in Jewish synagogues of this era. Note, there were no overtly Christian symbols, which is not surprising as those symbols, such as the Ichthys, were not developed until later. The evidence shows that this small congregation was outside the fold of the main Jewish faith of that time. It had either purposely isolated itself or Jews forced it to build away from the mainline Jewish synagogues. A Messianic congregation would easily fit the bill, as Jews of that time would consider them a rogue synagogue. Rome destroyed the synagogue in 66 AD when they sacked Magdala during the crushing of the of the Jewish revolt at that time. The R0mans destroyed the Jewish temple in 70 AD as part of the same campaign.